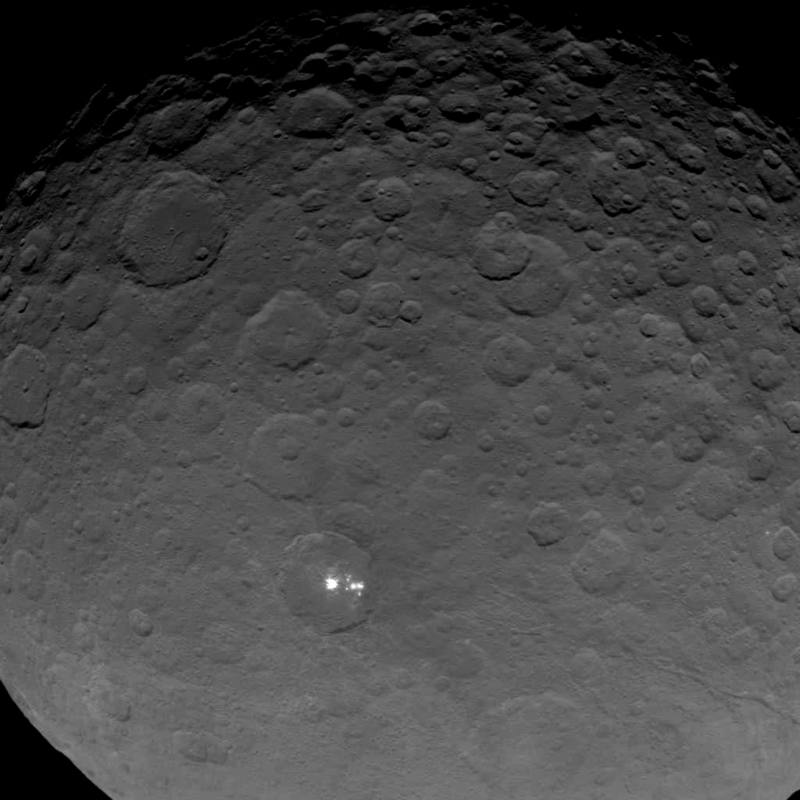 Ever since it was first spotted by Hubble in 2003, the nature of the curious bright spot on Ceres has been an intriguing mystery for scientists. And even as NASA’s Dawn spacecraft approached the dwarf planet earlier this year the bright spot continued to mystify, gradually resolving into first two and then multiple, separate spots as Dawn got closer and closer. Now in its first mapping orbit of Ceres, Dawn’s view of the bright region is the best it’s ever been – and we’re still not quite sure what it is. One thing scientists are fairly certain of, though, is that it’s an area of reflective material. The image above was acquired by Dawn on May 16 from a distance of 4,500 miles (7,200 kilometers). The spot – which is clearly made up of several smaller spots – is visible in the center of a crater. “Dawn scientists can now conclude that the intense brightness of these spots is due to the reflection of sunlight by highly reflective material on the surface, possibly ice,” said Christopher Russell, principal investigator for the Dawn mission at UCLA. Ok, maybe that sounds like a quote from Captain Obvious but there were some at one point who suggested that the bright spots are the result of light sources… of what origin I can only imagine. 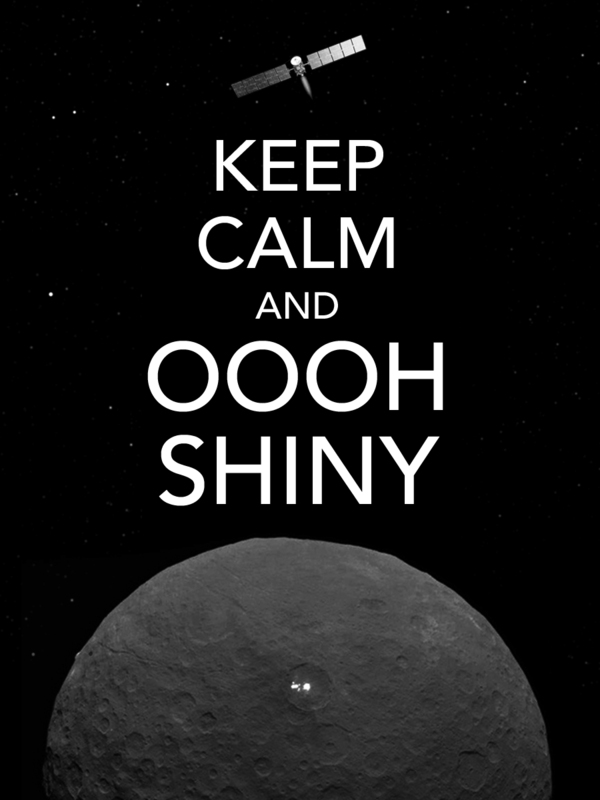 But measurements of Ceres’ light curve as it rotated into and out of direct solar illumination shows that the spots dim as they move into darkness – which wouldn’t be the case if they were emitting light. And we know Ceres is made up of a lot of water ice – not unlike many of Jupiter and Saturn’s moons – and so having a bright spot be the result of the Sun shining off of exposed areas of ice just makes the most sense. 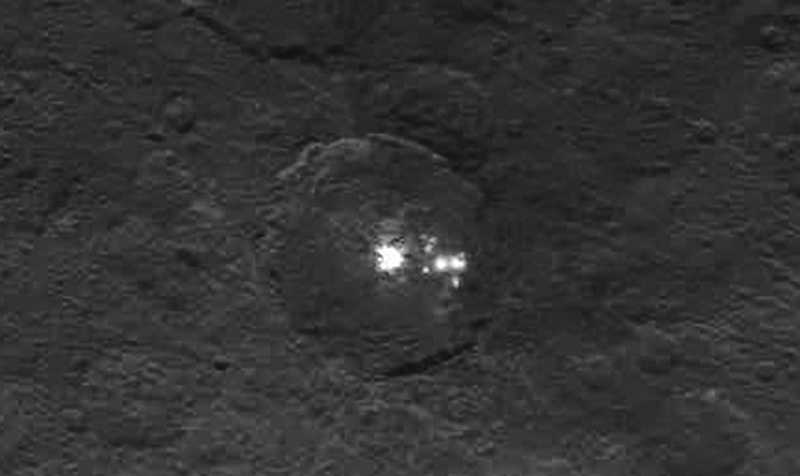 Why there aren’t many more of these spots on Ceres (there are a couple of others) is a question that may be answered in the coming months. See more updates from the Dawn mission here. Previous Post Just Your Typical Everyday View of a Mountain on Another Planet. NBD. Appears to be skylights of the cereian community living below ground to escape the elements.